Care2 Causes | Bolivia Bans Coca Cola To Honor Mayan "End of Capitalism"
Move over, Mayor Bloomberg. Your big-size soda ban was a great start, but, in the Great Soda Wars, you’ve been upstaged by Bolivia. The Bolivian government has been planning to celebrate this date in other ways, including various events that will take place at the Southern Hemisphere’s Summer Solstice on La Isla del Sol, one of the largest islands in Lake Titicaca. It’s not the first time a large American corporation has found itself out of favor with the country of about 11 million. McDonalds was unable to make a profit there and pulled out in the early 2000s. The consumption of Coca-Cola products has tripled in Bolivia since 2001 and has increased notably in all Latin American countries. As WorldCrunch says, Venezuelan leader Hugo Chavez has called on his citizens to drink Uvita, a grape juice produced by a state-run company, instead of Coke. According to the Bolivian website Opinion, both Cuba and North Korea ban Coke. …sales of coca leaf are big business in Bolivia, accounting for 2% of the country’s GDP, or approximately $270 million annually, and representing 14% of all agricultural sales. Besides, coca is legally sold in wholesale markets in some Bolivian cities. There’s even a cocaine bar in La Paz. The decision of Coca-Cola’s ban in Bolivia came in a time when the country is pledging to legalize the consumption of coca leaves, which are notoriously processed clandestinely into cocaine, and were declared an illegal narcotic by the UN in 1961, along with cocaine, opium and morphine, in spite of its consumption being a centuries-old tradition there, strongly rooted in the beliefs of various indigenous groups. Morales charges that “Neither the US nor capitalist countries have a good reason to maintain the ban on coca leaf consumption.” Is his thought to suggest that such a ban on coca leaves is an affront to Bolivia’s traditions, rather than out of serious concerns about illegal narcotics? 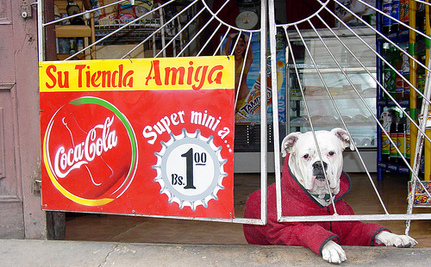 A Bolivian blog, Nada nos libre de Escorpio, offers more of a mundane rationale for banning Coke, the connection between obesity and other health problems and the consumption of sugary beverages. “El veneno es asi” (“this is the poison”) is written over a photo of a Coke bottle, alongside a skull under which is a knife and spoon. Keenly aware of the allure of Coke and other aspects of the Western diet, other Latin American countries including Brazil have been making efforts in the form of government policies to preserve traditional foods and eating practices. If nothing else, Bolivia’s ban on Coke is a wake-up call for us to take a moment and think: How much of the company’s products do we consume, perhaps not Coke but in the form of Dasani bottled water and other beverages? How hard is it for any of us to go Coke-free? McDonald’s and Coca-Cola as Olympics Sponsors? Photo by Adam Jones, Ph.D.
"Still no word if Pepsi will be treated likewise." So clearly it's got nothing to do with "the end of selfishness, of division.". It's got to do with a scum-sucking liar making a name for himself bullying people. I wonder how much money Coca-Cola's competitors gave him for this? Or is victimising an american company a big enough vote-winner just by itself? Oh and it's also not abou health either, since he's advocating a drink that's also full of sugar. Wonderful example. Idiotic to suggest banning alcohol: it's been done before and without any success. Banning cigs would be good but they can be smuggled in. Muslims and Mormons should note that aspartame gives rise to methyl alcohol in the body which is far far worse than 'normal' alcohol. Perhaps 21/12/12 will usher in a period where love replaces greed and we all work for the benefit of the planet and its inhabitants. They shouldn't ban it because it's a U.S. based Capitalist Co., but they shoudl educate the Bolivian people into not drinking JUNK, dirty water high fructose corn syrup, the root of all empty calorie drinking obese people. A ban on Coke, good, now if they could get around to banning the Kock Bros. as well.